“Today, I am trying to set the groundwork to include the children of NKR into the international community. They deserve a high-standard education and access to the world of information. • Promote an improved level of education through the introduction of technologies in the classroom, the school and the family. • Encourage equal opportunities through providing a laptop to each child. • Promote use of laptops as teaching aids. • Introduce educational content through the use of modern technologies. • Create a system of educational and technical support through development. • Secure parental participation for the correct and responsible use of technologies, for the benefit both the children and the parents. • Secure participation of all parties in the development of information and decision making. • Use all possible technological means to make the educational programs more appealing. • From the moment of handover, the laptop becomes the property of the student, in accordance with the rules stated in the bilateral agreement read and signed by the parent. • The laptop should be mainly used for educational purposes, i.e. be related to studies. • The technical support of the laptop is provided by the project in accordance with the serial number of the laptop assigned and connected to the personal details of the child. This will ensure that students do not exchange laptops. • The internet connection provided by the project is supervised by the admins, to ensure the safety of the children. However, parental and teacher guidance of the correct use of the laptop is expected as well. • The project team will periodically install online teaching programs, which can be applied by teachers for better organizing of the classes and the students to work on their school projects. NUR project commenced in 2011. The aim of the initial stages was to provide laptops to the students of the Nagorno Karabagh schools, mainly those of Stepanakert and Shushi. First shipment of XO laptops arrived in Stepanakert in 2012. The project organized trainings for teachers. Simultaneously, laptops were provided to the students and the faculty of 12 schools in Stepanakert, 3 in Shushi and the school of the nearby Karin Tak village. Servers and necessary equipment were installed in each of those schools. In 2013, individual laptops were provided to 4000 elementary school students. In the following year the program was expanded beyond Stepanakert, to include major town Martuni, Askeran, Martakert, Hadrut, Berdzor, and Karvachar. NUR is implementing a similar program in Yerevan and Echmiadzin, every year laptops are distributed to the “Republic of Argentina School’ in Yerevan and ‘Eduardo Eurnekian school’ in Echmiadzin. In order to encourage use of computers among students, in 2013-2015, 3000 Classmate laptops were distributed among students of 6th and 7th grade. The idea is to use those ingrades 6 to 9 for various subjects. During the 2016-2017 school year, NUR project has expanded its activities to other areas. Computers were delivered to the students of the villages Haterk, Ughtasar, Hatsi, Nor Seysulan, Vanq, Medz Taghlar, Ukhtadzor and also Aknashen and Lusagyugh. Up to now, NUR project has handed 9261 computers, from which, 7389 of XO type (1st to 4th grades) and 1872 of Classmate type (6th and 7th grades). Below is the corresponding table according to the type of computer and amount of owners in each institution. These laptops have basic differences of appearance, program support and hardware. XO is designed for the elementary school students and becomes redundant as the students grow up. Its simplified software is rather limited already for the students in the middle school. Classmate, on the other hand, provides wider possibilities through its more sophisticated software. The Classmate (formerly, Eduwise), is an Intel product. Basic computer skills entail partial proficiency in operational systems (Windows XP, Windows 7, Windows 8,Windows 10). This is exactly what the Classmate is designed for. XO is STURDIER and is designed for the convenience of smaller children, in this and its speed it is inferior to the Classmate. 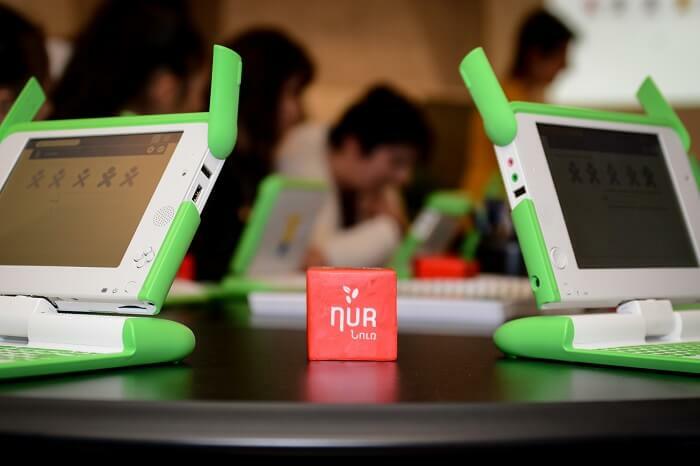 Taking into consideration these differences, the NUR provides XO laptops to the children as they start school and the opportunity to have it exchanged for a Classmate at the end of the 5th grade (elementary). Maintenance has been an essential part of the NUR and one of its main conditions to avoid loss of computers. In this regard, the program provides free technical support with specially trained staff who carry out repairs and program updates. The support deals with both hardware and software. Any issues related to the laptops should be resolved by our staff only, uses are advised against seeking other means. Should they chose to do so, they lose the right for any future maintenance and technical support. Students, parents or teachers can seek advise from the NUR offices in Yerevan or Stepanakert. The problem is registered (to keep statistics), and the laptop is transferred to the regional staff for repairs.